Tigeres!!!! Rob Schneider is a fan. 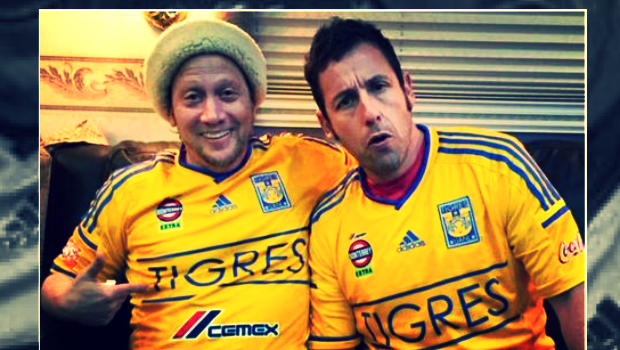 I wonder if Rob Schneider knows that Tigres will be playing tomorrow in the CONCACAF Champions league vs Herediano. Either way, Rob is a Tigres fan and wears the jersey proudly. The man is the head, but the woman is the neck. And she can turn the head any way she wants. Rob’s wife is Mexican so this is most likely the case here. This brings up an interesting topic of why are people choose to be fans of teams? Usually you would think of fans being from the city of the team, but this is not always the case. Now days, you can probably hear the term “plastics”, or fake fans, or fans because a team increases in popularity. This is an interesting, because some say you can’t be a fan if you are not from that city and live there. Yet in Mexico and in the US, you will see many people with Manchester United, Barcelona, Real Madrid or even Messi/Argentina jerseys, who may not have even stepped foot in the cities or countries of these teams. We had a slight discussion on this topic during the Los Cachirules podcast. Make sure you listen in here and give your feedback to our twitter account. Blows thrown as Queretaro advance! The Azteca commentators analyzing Marco Fabian spit!